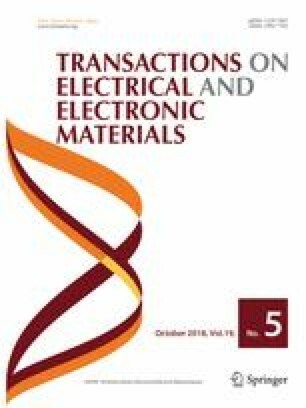 In this paper, in order to develop the composition ceramics for piezoelectric actuator. (1 − x)(Na0.52K0.443Li0.037)(Nb0.883Sb0.08Ta0.037)O3 − x(Sr0.95Ca0.05)ZrO3 ceramics were sintered at 1020 °C by the conventional solid-state method. The effects of (Sr0.95Ca0.05)ZrO3 substitution on their microstructure and piezoelectric properties were systematically investigated. The orthorhombic-tetragonal coexistence phase has been found in the ceramics with x = 0.01, 0.015 and x = 0.02. The maximum value of d33 was 322 pC/N at x = 0.025 composition ceramics with the rhombohedral phase. The (Sr0.95Ca0.05)ZrO3 substitution increased the density and then aided the grain growth of specimens. When x = 0.01, the optimal physical properties of d33 = 254 pC/N, εr = 1096, kp = 0.46, and Qm = 156 were obtained, respectively, for piezoelectric actuator application. This paper was supported by the 2016 National Research Foundation of Korea (NRF) Fund.